Our waterproofing systems provide very attractive and superior protection for all types of above grade decks and waterproof coverings. These include Wood Based Decks or Concrete Decks, deck restoration systems, recoating systems and under-tile waterproofing waterproofing systems. They are used in residential housing, hotels, apartment buildings, parking garages, RV, schools, houseboats, around pools or in office buildings. These waterproofing products are proven to perform and last in the most extreme climates. For waterproofing decks we recommend the excellent BASF MasterSeal Traffic Systems (formerly Sonoguard Deck waterproofing & Conipur Waterproofing). MasterSeal / Sonoguard features outstanding performance and easy-to-use application. It is suitable for a wide variety of applications. MasterSeal / Sonoguard is ICBO rated and Miami-Dade approved. We stock the topcoat for MasterSeal / Sonoguard is available pre-tinted in tan and light gray. We also stock Sonoguard Tintable topcoat that can tinted to one of 40 tint colors and 470 custom colors. 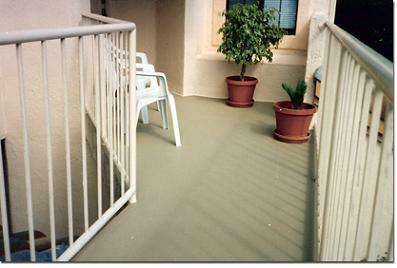 Installation: See the balcony waterproofing Wood Based Deck or Concrete Deck examples at the bottom of this page. When waterproofing parking garages & vehicular decks or where high durability and a quicker return to service time is critical we suggest the outstanding Conipur Plus vehicular / parking garage waterproofing system. Also, the Conipur II is the Quickest Curing system is popular and can be completed in 1 day in many cases. More information about parking garage repair, restoration and maintenance. Pavement Coatings: We also have a full selection of the industries best pavement coatings. StreetBond is an outstanding product, available stock in 20+ standard colors and 11 Sun Reflective (cool) colors. Its suitable for asphalt or concrete and available in both vehicular and pedestrian grades. 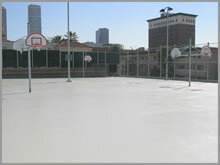 Tuf-Trac / MasterSeal 658 athletic court and pool-deck coating: This non-skid epoxy-acrylic super-tough coating is easy to use. 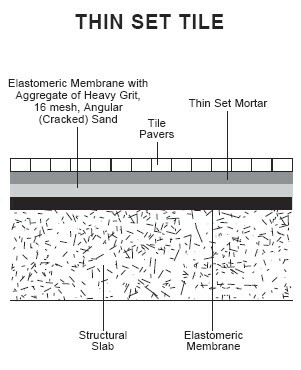 Ideal for coating concrete exposed to water (see pool deck project) and over blacktop / asphalt surfaces. Note: StreetBond / MasterSeal 658 / RhinoTop are NOT ELASTOMERIC AND WILL NOT COMPLETELY WATERPROOF BALCONIES OR WOOD SURFACES, but it will protect the surfaces from surface water or damage. These are easy to apply and provides a beautiful, long-lasting low-skid surfaces. They can be used to refresh old topcoats. These products are recommended for cool deck restoration, sport surfaces, tennis courts, athletic courts, around pools, for slippery walkways and where cool-deck might be used. It is applied in just ONE DAY using standard roll-on painting tools. Sonoguard System (ICBO, Class-A fire rated, sand or rubber, tinted topcoat. be created. Not for first time applicators. 80-160 sq.ft. Deck Re=Topcoat Kit, Tan New. Simple low-cost kit for small balconies. Coats 160 sqft in 1 coat, or 80 sqft in 2 coats. Solvent based, not for use in VOC restricted areas. 150 sq.ft. Restoration Kit low VOC, for any location. 150 sq.ft. Recoat Kit low VOC, for any location. For pedestrian waterproofing applications, we recommend our rubber aggregate for its resilience, flexibility, lower surface deck temperature, low moisture absorption, and provides an excellent feel & wear. 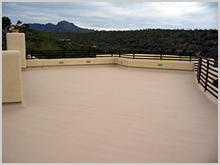 For a sanded finish on pedestrian decks, we recommend #2/16 deck-coat sand. Its a fine grade which is washed and kiln dried for the best quality sanded finish decks. For vehicular traffic areas, we recommend the coarser #2/12 deck-coat sand for enhanced wear resistance and greater slip/skid resistance. areas, basements, garage floor, airplane hangers, chemical storage, etc. 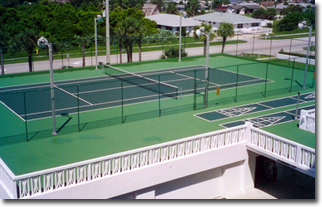 Pavement Coatings: -- StreetBond, MasterSeal 658 and Tuf-Trac | Recommended for sport surfaces, athletic courts, gaming, courts, handicap ramps, pool decks, cement walkways, school walkways and other concrete or asphalt surfaces. (These are not waterproofing grade products). Users should read through this information BEFORE ordering. Note: Polycoat products are recommended for licensed & trained applicators. Our Sonoguard systems are easier to use and suitable for less frequent applicators or skilled do-it-yourselfers. drying epoxy-polyamide penetrating primer/sealer which penetrates and seals porous surfaces to improve adhesion -- excellent on concrete and pool decks. Read all MSDS sheets before using materials. The illustrations below are intended as a general guide and not a replacement for factory procedures. Single component systems need to be applied in warmer weather (60F+ is best). Practice your technique first. We recommend the Sonoguard deck coating waterproofing system together with rubber aggregate for new applicators. It is easier, faster and less prone to problems than other systems. Rubber aggregate systems have many benefits over sand (greater elasticity of finished system, cooler decks, rubber does not sink into basecoat, topcoats last longer over rubber, ease of repair and touch-ups). On the other hand, sand decks will have a more consistent surface appearance. Troubleshooting Guide. 1. OLD Decks: Remove and scrape away all old loose or cracked coatings, caulking and sealants. It is especially important to remove ALL silicones or silicone residues. 2. Pressure wash concrete, using 3000 psi minimum washer. Remove all loose surface materials or old coatings and any oil based stains. Let dry 1 to 2 days. 4. Be sure final the concrete surface has some "texture". Smooth surfaces will need to be blasted to create a good bonding surface. As an alternative, you will need to use epoxy 770 primer using a 1/4" nap phenolic core roller. (All new concrete must be fully cured before work begins). Primers, if needed, are applied just before base coat and only need to dry tack free. 5. Caulk & Seal: Prime all metal surfaces using 733 primer before caulking. Use NP-1 or Novalink to fill any big holes or cracks. Let sealant cure 24-72 hours. 6. If needed in cricket areas, apply 4" WEBSEAL at the corners, deck-to-wall interfaces and all other high stress leak-prone areas. 7. Bridge all deep field cracks, joints and flashing areas by apply 4" white fiberglass 20x20 mesh tape embedded in Sonoguard basecoat or NP1 sealant. Use a 3-course process to hide seams. This is much like taping a drywall joint wherein you taper joint to adjacent surfaces. 8. Let NP-1 or basecoat / taped areas cure a minimum of 24 hours. 9. Blow off surface and work area using a high power gas blower. 10. Remove and y skin and pre-mix Basecoat 5 minutes with a drill and mixer. Do not whip air into coating. Apply Sonoguard Base Coat at 2 to 2-1/2 gallons per 100 sqft. using a 1/4" notched squeegee, then back-roll to smooth out using a phenolic core (solvent proof) 1/4" nap roller. Hint: First apply basecoat to all perimeter edge areas and up the edge of all flashings using a disposable brush. Hint: For highly sloped surfaces order "Flash Slope" basecoat to prevent excess running of basecoat. 11. Within about 20 minutes, while material is wet, broadcast rubber granules at rate of ~ 20 lbs per 100 sqft. (fully cover all of base coat with a full layer). Broadcast by throwing it out by hand. Rubber Granule Info. Do not roll after applying. IF USING SAND: A second basecoat must be applied after the first basecoat has cured, and the sand is broadcast into the 2nd layer. Do not put sand into the first basecoat layer. The second layer only needs to be thick enough to adhere sand (about 1 gallon per 100 sq.ft.) Do not roll after applying. 12. Mark off area with Caution tape to keep off traffic during cure periods. Wait 1 to 2 days for cure, depending on heat and humidity. Base coat cure can be accelerated by misting with water. 13. When you are ready to begin topcoat, broom way excess rubber. Then blow off the rest using a high power gas blower. 14. Remove any skin and pre-mix Topcoat 5 minutes with a drill and mixer. Do not whip air into coating. Top Coat with Sonoguard Topcoat at 1-1/4 gallons per 100 sq.ft. using a phenolic core (solvent proof) 1/4" nap roller and roll out of a paint tray, being careful to get the excess of the roller before applying (do not dip in the bucket and roll on, you will apply too thick of coating). Do not apply topcoat with excessive thickness. Pooling areas and too much thickness can result in small blisters on hot days. ALL custom tinted products need TWO topcoats. Standard Sonoguard pre-tinted topcoats will benefit from a second coat. Most Polycoat System topcoats require two coats. Hint: First apply topcoat to all perimeter edge areas and up the edge of all flashings using a disposable brush. Hint: If the top coating has globs in it which do not disappear with power mixing, then strain topcoat through painters sock into the paint tray before applying. 15. Mark off area with Caution tape to keep off traffic during cure periods. Let cure 48-96 hours before traffic (depending on temperature and humidity). 16. Hint: If a high traffic system is required, add a 2nd layer of topcoat at the rate of 1 gallon per 100 sq.ft. * Remove any "skin" off the top of Sonoguard material before mixing or starting application. Thick skin can be cut with a razor knife and removed in one big piece. * It is HIGHLY recommended to do a trial area first to practice your technique (an old piece of plywood sheet works good). * When re-sealing cans, be sure and COMPLETELY WIPE sealing surfaces clean. Otherwise product in this area will cure and permanently glue the lid to the can. first). Then apply material to the field. * Use vinyl gloves. This material is hard to get off. Use WD40 to remove from your skin. store. Remove from your hands using WD-40. Caution: Protect your skin and eyes from xylene. * If the basecoat has to set for some period before the final topcoat can be applied, cover the deck with 6 mil black plastic sheet. This will protect it from UV damage as well as contamination from other trades. This cost about $1.00 per 100 sq.ft. This investment is more than save in the clean-up needed prior to topcoat. Deck coating technicians can save one day of process time by using PC50 accelerator and Polycoat 440 for seam caulking in lieu of NP1. Make a paste of these materials, about 1-2 quart at a time, and 3-course your seams with fiberglass deck webbing as in previous process. This is a process which needs to be practiced before using. Mixing ratio is about 1/2 pint of PC50 to 1 gallon of PC440, depending on cure rate desired and the days temperature. This material can also be poured into low spots to build them up. Let materials cure to tack free before applying base coat layers over the top. CAUTION: This seam materials must completely cure before applying base coat over it. In cold weather, it may take a full day or more, even with the accelerant. 1. Deck should be constructed of exterior grade plywood, 3/4" minimum thickness, tongue and groove, knot free on outside face. Plywood should be screwed down using deck screws. We recommend gluing beam faces before attaching plywood (glue and screw). 2. GRIND down or rest all screw heads which are not completely set to deck level. DO NOT hammer them in. This will cause loose decks and seam failures. Also grind any high wood areas (steps) along the seams. Good preparation is the key to good decks. 3. UNDER all metal, use a bead of NP1 caulking sealant, AND use NP1 caulking on both the balcony face drip-edge metal to wall interface and deck top interface. Attach all metal flashing (generally its nailed). 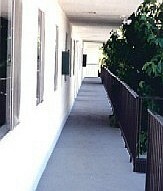 Ultra-low rise drip edge is recommended at the balcony edge. High lipped edge metals will cause ponding water along the edge. Clean metal with acetone or xylene and a rag, the apply 733 primer on all metal surfaces immediately before application of NP1 Sealant or any base coat. ALL metal must be primed. 5. Let NP-1 (or basecoat) cure a minimum of 24 hours. It can take 48 to 72 hours in cold or very dry weather. Water mist will accelerate the cure. 6. Blow off surfaces and work areas using a high power gas blower, air or thoroughly broom. 7. Remove any skin (use a gloved hand if needed) and pre-mix Basecoat 5 minutes with a drill and mixer. Do not whip air into coating. Apply Sonoguard Self Leveling Base Coat at 2 to 2-1/2 gallons per 100 sqft using a 1/4" notched squeegee. Then back-roll to smooth out the material using a phenolic core (solvent proof) 1/4" nap roller. Back-rolling is important. Back-rolling brings air from the surface of the deck to the top of the basecoat so that it can escape, and evens out the thickness. Hint: First apply the basecoat to all perimeter edge areas and up the edge of all flashings using a disposable brush. Hint: For highly sloped surfaces order "Slope Grade" basecoat to prevent excess running of basecoat. IN COLD WEATHER, DO NOT USE FLASH SLOPE. IT WILL BE TOO THICK (use two thinner coats of self leveling). 8. Within about 20 minutes, while basecoat material is wet, broadcast Rubber granules at rate of ~ 20 lbs per 100 sq.ft. (fully cover all of base coat with a full layer). (Broadcast by throwing it out by hand). Rubber Granule Info. Do not roll after applying. 9. Mark off area with Caution tape to keep off traffic during cure periods. Wait 1 to 3 days for cure (depending on temperature and humidity). Cure can be accelerated by misting water onto surface. 10. When you are ready to begin topcoat, broom away excess or loosely attached rubber with a stiff broom. Then blow off the rest using a high-power gas blower. 11. Remove and skin and pre-mix Topcoat 5 minutes with a drill and mixer. Do not whip air into coating. Apply Sonoguard Topcoat at 1-1/4 gallons per 100 sq.ft. using a phenolic core (solvent proof) 3/8" nap roller out of a paint tray, being careful to get the excess of the roller before applying (do not dip in the bucket and roll on, you will apply too thick of coating). Do not apply topcoat with excessive thickness. CAUTION: Too thick of material or pooling areas and can result in small surface blisters. Apply only enough material to cover the sand or rubber granules, but not to cause material to pool. ALL custom tinted products need TWO topcoats. Standard pre-tinted topcoats will benefit from a second coat. Most Polycoat Systems require TWO topcoats. Hint: First apply topcoat to all perimeter edge areas and up the edge of all flashings using a disposable brush or mini roller. THEN apply top coating to the center areas. 12. Mark off area with Caution tape to keep off traffic during cure periods. Let cure 48-96 hours before traffic (depending on temperature and humidity). 13. For custom colors (when using tintable Topcoat with Color Packs) deck surfaces, a second layer of Topcoat is recommended to achieve good color coverage. For white or cream color decks, sometimes a 3rd coat is needed. You will need an additional 3/4 gallon per 100 sq.ft. per coat. 14. Hint: If a very high traffic system is required, add a 2nd layer of topcoat at the rate of 3/4 per 100 sq.ft. 15. Hint: If you are using a TINTABLE or darker color topcoat, apply it in TWO thin coats (allowing it to cure between coats). This provides the best coloration and long term resistance to fading. * Poor curing, lumps: Failure to mix thoroughly by power mixer before application; very dry climate (moisture is needed for cure). * Bubbles: Wet or contaminated deck; extreme hot temperature or deck surface. * Plywood splits and splinters: Basecoat applied over particle board deck, not exterior grade plywood; plywood was rained on before base coat application. * Splits: Wood deck nailed not screwed; screws missed joists; too few screws; poor sub-framing (add more or double the joists); plywood was rained on before basecoat application. * Lumps: Failure to remove skin before mixing; poor mixing; failure to strain before putting into roller pan. * Poor Cure: Failure to mix thoroughly with a power mixer; failure to apply topcoat out of a roller pan; too thick of topcoat applied, wrong nap size used (use 1/4" nap only). * Poor Coverage: Failure to apply 2 topcoat layers; too thin of material applied. See Maintenance and Helpful Notes from Concrete deck above. Summary - Use exterior grade tongue-and-groove plywood. Screw and glue plywood to framing. Tape and waterproof all deck seams and metal-to-deck interfaces using 440SF solvent free basecoat system, as above in wood based decks. Detail Spec. Apply first basecoat layer at 2 gallons per 100 sq.ft. ; let cure. Apply second basecoat layer at 1 gallon per per 100 sq.ft. and immediately broadcast deck grade 16 mesh sand into it (to refusal); let cure, then broom off excess. Then apply thin-set and tile. Epoxy grout system is recommended. Read all detailed product specs before proceeding. Polycoat General Guidelines, Detail Specification, Polycoat Architectural Details.